This past weekend Gustavo Dudamel, the Los Angeles Philharmonic and pianist Yuja Wang concluded a mini-series that revolved around the three piano concertos of Hungarian composer Béla Bartok. The first concerto was the centerpiece of last week’s concerts (my review is HERE). The series — the second of two, following a Schubert-Mahler cycle earlier in May — also concluded the Phil’s 98th season and 15th in Walt Disney Concert Hall. The second and third Bartók piano concertos are quite different, in part because Bartók was suffering from incurable leukemia as he wrote his final concerto (in fact, the last 17 measures were orchestrated by Tibor Serly, one of Bartók’s friends and pupils). Moreover, while Bartók wrote his second concerto knowing that he would be the soloist, he composed the third for his second wife, Ditta Pásztory, although she did not play it for nearly 20 years. György Sándor played the premiere on Feb. 8, 1946 with Eugene Ormandy and the Philadelphia Orchestra. In an interesting historical twist, Sándor was the soloist when the L.A. Phil gave its first performance of the second concerto on December 20, 1962 with Zubin Mehta conducting. Now age 30, Wang is one of the most dazzling pianists on the world stage today. After her performance of the second concerto Friday afternoon she encored with Bizet’s “Variations on a Theme From Carmen,” as arranged by Vladmir Horowitz, and her bravura rendition of that work was certainly reminiscent of the great Russian pianist. For the record, she played three (!) encores on Thursday night: her own shared arrangement of Mozart’s Rondo “alla Turca” from Piano Sonata No. 11 in A Major, K. 331; the Russian Dance from Stravinsky’s Three Movements from Petrushka, and Schubert’s Gretchen am Spinnrade, D.118. She added two more powerhouse encores Sunday afternoon — this curmudgeonly critic wishes she had played something akin to the Schubert simply for contrast, although Bartók’s third concerto is less an endurance contest for iron fingers and far more lyrically romantic than either of the first two. Which doesn’t mean there weren’t plenty of moments for Wang to show off — quite the opposite. The audiences on Friday morning and this afternoon were enthralled both with her playing and her dress (what, you expected me to ignore the lime-green with the slit-all-the-way-up-the front on Friday and the shimmering black VERY short dress this afternoon? No chance). Her virtuosity continues to be dazzling. It’s hard to believe that anyone could write anything as complex as what Bartók composed and that anyone could play it with the speed with which Wang negotiated the flying powerful octaves, runs and trills. Yet, again, for this critic, what was equally impressive was how Wang delivered the delicate, lyrical passages in the third concerto. Dudamel surrounded both concertos with Stravinsky’s Symphonies for Wind Instruments and Leoš Janáček’s Sinfonietta. The former is a nine-minute series of craggy fragments for the woodwinds balanced by melodic (for Stravinsky, at any rate) brass chorales. Dudamel, who conducted without a baton but with a score, led the meanderings with panache and the orchestra played it skillfully. Janáček’s Sinfonietta is a 22-minute work comprised of five short movements, the first and last of which are brass fanfares played by 13 instrumentalists (11 trumpets and two Wagner tubas) that, on Friday, were arrayed along the front row of the choral benches. The performance proved to be a great showpiece for the entire brass section and Principal Timpanist Joseph Peirera. The London Symphony has been in the news lately for its announcement that Sir Simon Rattle will become the ensemble’s Music Director in September 2017 (LINK). Michael Tilson Thomas, one of orchestra’s former Principal Conductors (1988-1995), has continued his relationship with the orchestra as its Principal Guest Conductor, and brings the LSO to Walt Disney Concert Hall Tuesday night. The concert, which is part of a cross-country U.S. tour that concludes Wednesday night in Santa Barbara, also celebrates Thomas’ 70th birthday. The Disney Hall program is Four Sea Interludes from Britten’s opera, Peter Grimes, Sibelius’ Symphony No. 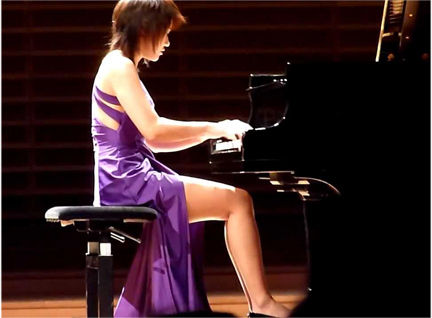 2 and Gershwin’s Concerto in F with pianist Yuja Wang (pictured right) as soloist. In Santa Barbara, Shostakovich’s Symphony No. 5 replaces the Sibelius. Both are in the “don’t miss” category. • L.A. concert information HERE. • Santa Barbara concert information HERE. • Read a New York Times review of a New York performance of the program to be played at Disney Hall HERE. David Allen, the reviewer, noted that Wang used in iPad instead of a paper score during her encore. Next concerts: Tomorrow at 8 p.m. Sunday at 2 p.m. Conductor? ), but don’t miss out on the remaining concerts this weekend. was written during a period of national struggle. composer’s works leading up to the centenary of his birth in 2013.
interesting (see some history details below in Hemidemisemiquavers). meant that all attention could be focused on her playing where it belongs. proved to be a satisfying conclusion to an excellent program. part of the consecration of the newly rebuilt Coventry Cathedral. first Japanese of the piece in 1956.
his first automobile — a vintage Ford. years after its premiere in Chicago.